Continuing from winning the 2015 World Interior News Magazine Best Hotel Award, the second phase of the YangZhou Heritage House Hotels & Resorts again impressed the design industry, and received favor from the world-level design awards by winning the 2017 International Property Awards: Best Hotel Award. 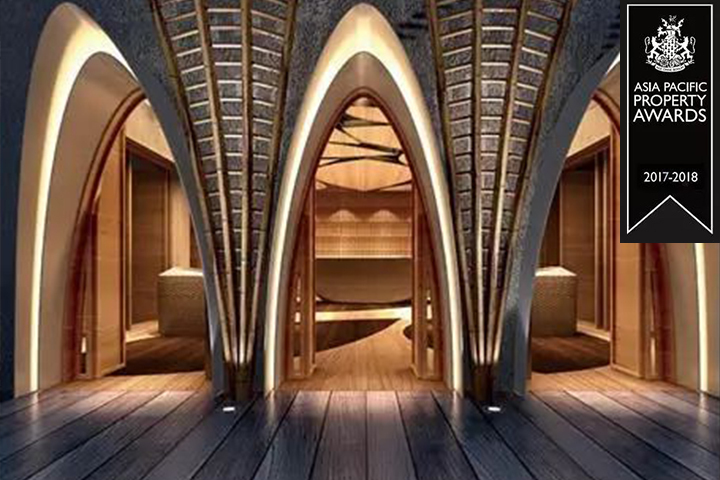 The YangZhou Hotel phase two centered its design with tea-leaves, bringing out the clear yet flexible power of life that extents and grows in the peaceful time. Verdant fresh green reflects the light yellowish burgeon, as if the air itself is fresh, peaceful, and youthful. All creatures await for the sun to shine and them to grow; like the scented tea await to blend with the boiled water, for its every leaf to release and relax. The life of tea-leaf concentrates into a purpose, that dissolves the meaning of a lifetime growth and prosper into the structure of shape and design of space. Combining and relating to the local culture, it brings out a peaceful internal world, and constructs a meaningful space and time. The transparency the tea-leaf displays when sunshine projects through it, is the best representation and evidence of the power of life and its burst. The designers feel and understand the blush of lighting,and they display its meaning in every details of the design after repeated consideration on texture and material. The fluency, relaxation of shape and style are actualized through digital modelling. In guarantee of the harmony of the entire style, each tea-leaf has been infused its unique lifestyle and shape. The digitized process of how rhinoceros and grasshopper create tea-leaves in the nature has been used in the design process, that forms tea-leaves of different lifestyle and shape under different function parameter. Departing from its outward appearance, the power of the thriving life has been re-sculptured more absolutely. The imitated naturally growing tea-leaves display various poses, natural yet energetic, overwhelmed by the vigorous life.